In the old days, kitchen design and construction was often an afterthought, playing second fiddle to other living spaces within the home. Many families quickly realize that their kitchen is the most used room in the house. Indeed, the kitchen is more than a room for eating – it is often a focal point for all sorts of activities within the home. As families grow, it often becomes apparent that the kitchen is in need of some serious attention. Older kitchens are often small, equipped with countertops that are flimsy and unattractive, cabinets that are cheap and uninspired, and appliances that are outdated and expensive to operate. Does any of this sound familiar? If so, it may be time to consider your own kitchen remodel. 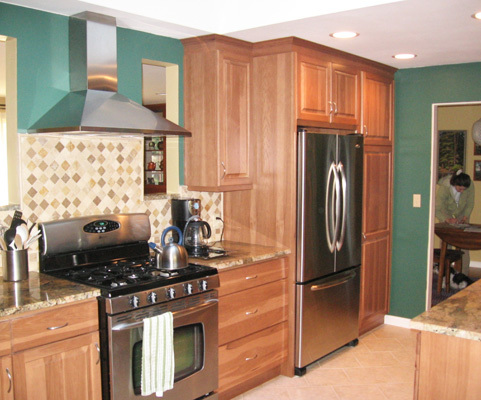 Mike Winter, General Contractor can help you create the kitchen you’ve always dreamed of. Whether you’re simply looking to upgrade the look of your kitchen, or are considering a complete remodel, we can help turn your spark of imagination into a reality. You probably have a general idea of what you would like your kitchen to look like, but there are many details you may not have considered. If you’re serious about your remodel and want to get started right away, your first order of business should be to find a general contractor with kitchen remodeling experience. Do you want to completely redesign your kitchen, or just certain aspects of it? What styles of kitchen cabinets, flooring, and countertop would you like? Will it be necessary to upgrade or move kitchen plumbing and/or electrical features? Will you be adding new appliances to your kitchen? How is your kitchen currently used, and how do you envision it? Once you have a general idea of what you want, the next step is to start breaking down the finer details of your Olympia kitchen remodel. Your lifestyle may be better suited to granite countertops and a tile floor, or you may be better served with laminates or synthetics. We will help you choose the colors and materials that work best for your needs and budget by applying our extensive experience. The design process should be fun and exciting, so we keep this phase of your kitchen remodel pressure-free so that you can make beneficial decisions. Creating your own custom kitchen masterpiece takes time, but with our professional expertise the process is streamlined and simplified. Our clients are often gifted with the spark of inspiration, and it’s our job to turn those ideas into the kitchen of their dreams. Kitchen Cabinets – Materials, design, shape, layout, stain, and finish must all be considered when choosing cabinets for your kitchen. Today’s cabinets come in an endless variety of shapes and sizes, so we will help you narrow down the best options for your style and budget. Countertops – Form and function must be considered when choosing countertops for your kitchen. Granite, composites, laminates, and other styles all have certain advantages and disadvantages, depending on your lifestyle. Flooring – Kitchens often receive a lot of traffic, so your flooring needs to be stylish while maintaining its appearance over the years. Flooring options for your kitchen remodel include everything from solid wood to laminates, in just about every color you can imagine. Stone and Tile – Stone and tile can be utilized in many different ways for your Olympia kitchen remodel. From granite countertops to hand-painted wall tiles, there are many ways that these materials can compliment your personality and aesthetic sensibilities. Lighting – Many older kitchens have poor lighting. A bright kitchen adds life to your home, and modern fixtures can be fitted with energy efficient LED lights that will save you considerably on your monthly electric bill. Wainscoting – This is a popular option for many homeowners doing a kitchen remodel. Backsplash – Your kitchen backsplashes can be more than simply functional, there are numerous options for decorative tiles and laminates that will beautify the entire space. Under Mount Sinks – This style of kitchen sink is becoming more popular because of its lean design and ease to clean. Heated Flooring – If you’ve never experienced heated flooring, once you give it a try you will wonder how you ever lived without it. Heated flooring is energy efficient and the most comfortable heat available for your home and kitchen. Crown Molding – The style of crown molding you choose for your kitchen remodel will add accent and flair to the space. Kitchen Appliances – Your taste and your lifestyle can be reflected in your kitchen appliances. Replacing older appliances with modern, energy efficient units can save you hundreds of dollars annually in electric costs. At Mike Winter General Contractor we will custom design your new kitchen by working along with you to address every detail. The kitchen you create will be a focal point of your home where you will be proud to entertain friends and family. Contact us today at (360) 628-6716 so that we can get started on your Olympia kitchen remodel.